The context menu can be enabled by setting the EnableHeaderContextMenu property of the corresponding GridTableView or column to true (the default value is false). The menu can be enabled/disabled for an entire GridTableView or for specific column only. This online demo illustrates how to use a header context menu in RadGrid for ASP.NET AJAX. It is quite useful if you would like to process operations like sorting or grouping on a per-column basis or show/hide some of the grid columns based on the end user's preferences. Sort the column data in ascending/descending/none order. Group/ungroup the column data in case the grouping feature of the control is enabled. Show/hide grid columns client-side by changing the state of the checkboxes beside each column name.This feature can be seen drilling down to the second menu group under the 'Columns' option). Filter the column data on two conditions related with a logical AND operator. Note that the items from the menu will be displayed dynamically depending on the grid configuration. 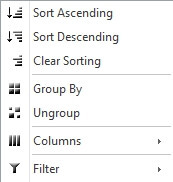 For example, if the grouping feature is disabled the 'Group By'/'Ungroup' options will be hidden, or if you choose not to use natural sorting (AllowNaturalSort=false) the 'Clear Sorting' item will be absent. <telerik:RadGrid RenderMode="Lightweight" ID="RadGrid1" Skin="Office2007" ShowGroupPanel="True" ShowStatusBar="true"
<telerik:GridBoundColumn SortExpression="UnitPrice" HeaderText="Unit Price" DataField="UnitPrice"
<telerik:GridBoundColumn SortExpression="OrderDate" HeaderText="Date Ordered" DataField="OrderDate"
<telerik:GridBoundColumn SortExpression="ContactName" HeaderText="Contact Name" DataField="ContactName"
In spite of having been created to allow for filtering the grid on two conditions, the new menu will give the freedom to set only one of those. The condition for which no data has been set will beignored and RadGrid will filter its data only on the one for which a filter function and a filter value have been set. The filtering menu remains independent for each column - this means that the filtering menu options vary by the column's DataType and the properties of the special controls will depend on any other specific column properties such as Mask, DecimalDegits, PickerType etc. The new filter menu can be used along-side the classic one. In this case, the GridTableView.IsFilterItemExpanded property should be set to true (the default value). When the two filter menus are switched on simultaneously, the data set for the first filter condition of the header context filter menu will be also set as filter data for the classic one and vice versa.If you want to use just the header context filter menu, then just set GridTableView.IsFilterItemExpanded property to false leaving, as mentioned above, the RadGrid.GridTableView/GridTableView.AllowFilteringByColumn property to true. For more information on RadGrid header filtering menu, refer to this blog post and see the live example here. From Q3 2010 on, RadGrid also enables showing column aggregates by using the HeaderContextMenu. You can turn the Aggregates submenu on and off by using the RadGrid.EnableHeaderContextAggregatesMenu / GridTableView.RadGrid.EnableHeaderContextAggregatesMenu property. This would be meaningful only if RadGrid.EnableHeaderContextMenu / GridTableView.EnableHeaderContextMenu is set to true. The Aggregates menu will show the applicable aggregates for the current column, thus offering the user a choice which one to view. Apart from the ready to use aggregates, the menu also exposes an option for a custom one, which can be handled manually. You can declare your own aggregates in the column definitions and yet use the HeaderContextAggregatesMenu, as it will overwrite the aggregate shown in the footer. <telerik:RadGrid RenderMode="Lightweight" AutoGenerateColumns="false" ID="RadGrid1" DataSourceID="SqlDataSource1"
<telerik:GridBoundColumn DataField="Discontinued" FooterText=" " HeaderText="Discontinued"
e.Result = discontinued.ToString() & " items discontinued, " & notDiscontinued.ToString() & " not"
Note that in order to be able to show the aggregates, you need to have ShowFooter property of RadGrid / the respective GridTableView, or ShowGroupFooter (when grouping is enabled)set to true. <telerik:RadGrid RenderMode="Lightweight" ID="RadGrid1" runat="server" AllowFilteringByColumn="True" AllowPaging="True"
btnClearFilter.Text = "Clear all filters"
lcShowRows.Text = "<label class=""rgHCMShow"">Show rows that:</label>"
lcAnd.Text = "<label class=""rgHCMShow"">And also</label>"
If you want to override the CSS rules of a header context menu, you have several options. You can use the OnClientLoad event of the menu to do that. Here is an example that adds a custom class from the server code. You can, of course, attach the event handlre in the markup and define the function together with the rest of your page scripts.